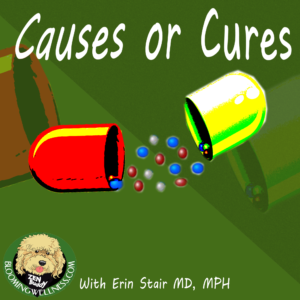 The second episode of my podcast Causes Or Cures is posted! Can I just add that, as long as my dog doesn’t have a barking fit, a podcast is so much easier than interviewing folks, recording them and then transcribing them? If you’ve been a reader of my blog, you know I’ve done a lot of those. This is so much easier, and I think better. It feels more authentic when you can hear a person in his/her own voice tell his/her story or explain his/her side rather than reading what I write. I’m glad I did this. We talk a lot about two timely topics in this episode: Opioids and Marijuana, with the essential question being, are they causes or are they cures?